Map Room staff recently found this ordinary looking booklet amongst material donated to the library. A rough English translation of the Polish text is ‘Sketches designed for Polish defences in Poland and the situation on the ground’. When opened, though, what treasures were found inside. As well as the eight pages of maps showing troop movements during the 1939 invasion of Poland by the German Army, bound into the pamphlet there were a number of loose sheets which dealt with the Warsaw Uprising of 1944. 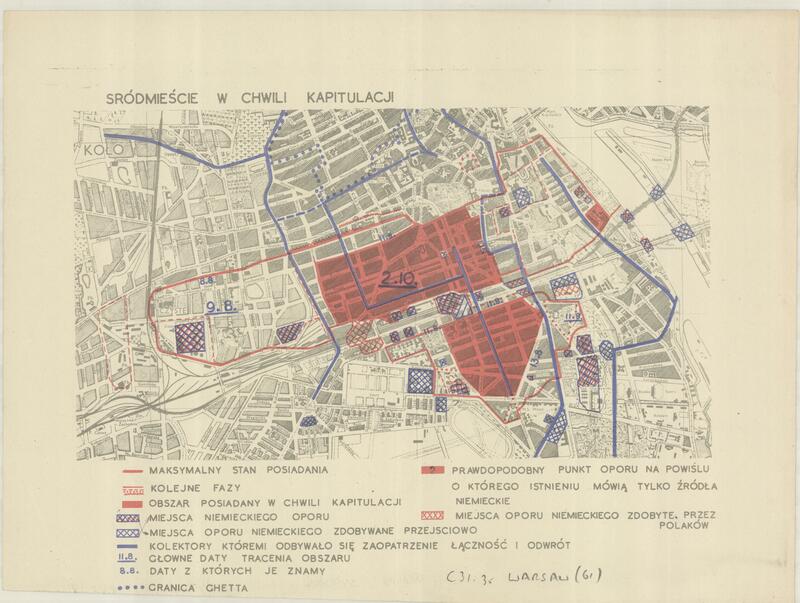 Only one map, showing details of destruction in the city, has any publishing information: ‘Prepared by the Building Department of the Polish Ministry of Industry, Commerce and Shipping. Printed in the Geographical Section of the Polish Ministry of Information’. The Polish Ministry of Information and Documentation dates to 1939, when the Polish Government in Exile formed. This branch was the main source of information and propaganda for the Polish war effort. The Warsaw Uprising of 1944 was designed to coincide with advances made by Soviet forces moving through Poland. Starting on the 1st of August, the insurgency was initially successful, with most of central Warsaw soon coming under Polish control. Continued success, though, depended crucially on Soviet cooperation. The deliberate halt of their advance just outside Warsaw allowed the German Army to re-group and defeat the Polish Resistance Home Army. This led to mass executions of both fighters and civilians and the destruction of large parts of the city. By January 1945 some 85% of central Warsaw was in ruin. We show here three of the maps dealing with the Uprising. The first is from a set of five maps showing blocks of houses held by the Polish Underground Army between the 24th of August and the 15th of September at 1:50,000 scale. The maps also show streets that were either fully or partly under the control of German forces. As can be seen from the image, in some cases the streets held by the Germans ran next to — and in one case through — Polish-held areas. (C31:35 Warsaw (58)). The second map shows areas of the city liberated by the Polish Underground Army between the start of August and the end of September (C31:35 Warsaw (63)). While the third shows the situation in the centre at the time of surrender (C31:35 Warsaw (61)). 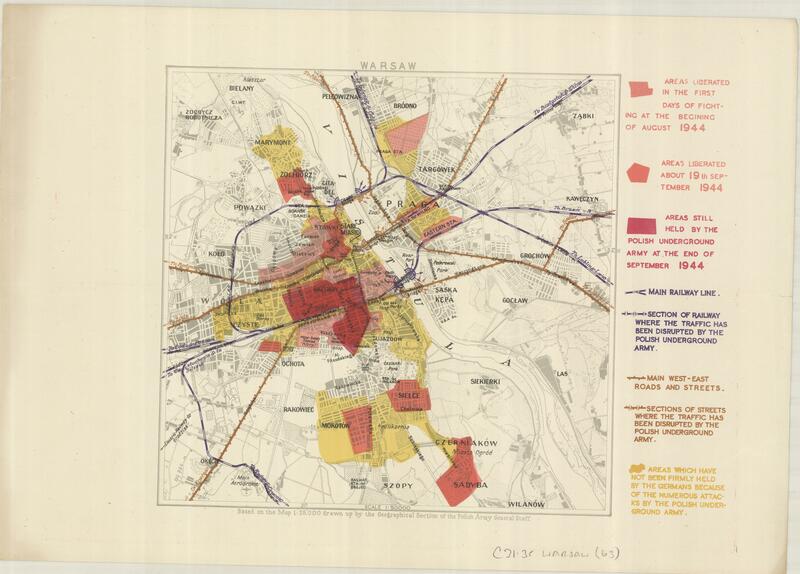 This series also includes four maps not shown here: one indicating the level of destruction in the centre (C31:35 Warsaw (59); one recording the make-up of the houses in the city (C31:35 Warsaw (62)); a general map of the city naming the districts (C31:35 Warsaw (60) and a map showing the Soviet front-line near the city on the 1st of August and 1st of October 1944 and fortifications around the city (C31:24 (21). This entry was posted in Uncategorized on 8 February 2013 by michaelathanson.